Describes "poor circulation" and "Stiffness"
Definition (NCI) Entrapment of the median nerve in the wrist that is characterized by numbness, tingling and painful movement. Definition (CSP) entrapment of the median nerve in the carpal tunnel, which is formed by the flexor retinaculum and the carpal bones; this syndrome may be associated with repetitive occupational trauma, wrist injuries, amyloid neuropathies, rheumatoid arthritis, acromegaly, pregnancy, and other conditions; symptoms include burning pain and paresthesias involving the ventral surface of the hand and fingers which may radiate proximally; impairment of sensation in the distribution of the median nerve and thenar muscle atrophy may occur. 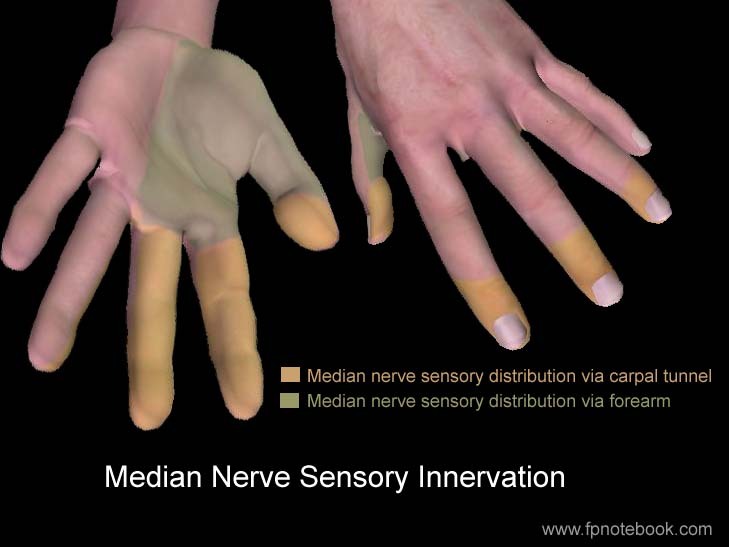 Definition (MSH) Disease involving the median nerve, from its origin at the BRACHIAL PLEXUS to its termination in the hand. Clinical features include weakness of wrist and finger flexion, forearm pronation, thenar abduction, and loss of sensation over the lateral palm, first three fingers, and radial half of the ring finger. Common sites of injury include the elbow, where the nerve passes through the two heads of the pronator teres muscle (pronator syndrome) and in the carpal tunnel (CARPAL TUNNEL SYNDROME).